Win The Guernsey Literary and Potato Peel Pie Society: Unravelling the secrets of wartime | SWITCH. 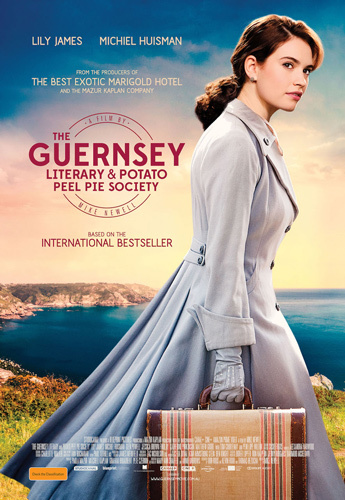 Based on the internationally best-selling novel by Mary Ann Shaffer, 'The Guernsey Literary and Potato Peel Pie Society' features a stellar UK cast which also includes Michiel Huisman ('Game of Thrones'), Jessica Brown Findlay ('Downton Abbey') Matthew Goode ('The Imitation Game'), Penelope Wilton ('Downton Abbey') along with revered British actor Tom Courtenay. The story commences in 1946 London when Juliet (Lily James), a charismatic and free-spirited writer, receives a letter from a member of a mysterious literary club that was started in Nazi-occupied Guernsey. Her curiosity piqued, Juliet decides to visit the island. There she meets the delightfully eccentric members of the Guernsey Literary and Potato Peel Pie Society, including Dawsey (Huisman), the rugged and intriguing farmer who wrote her the letter. As the secrets from their wartime past unfold, Juliet’s growing attachment to the island, the book club and her affection for Dawsey will change the course of her life forever. Click here to read our theatrical review of 'The Guernsey Literary and Potato Peel Pie Society'. The 'The Guernsey Literary and Potato Peel Pie Society' competition has now closed. Winners will be announced shortly. Competition opens at 5pm AEST on Sunday 8th April 2018 and closes at 11:59pm AEST on Sunday 15th April 2018. Ten winners will be chosen at random on Monday 16th April 2018. To successfully win, entrants must fulfil the above entry conditions before the time the competition closes. Current members/followers are eligible to enter the competition. Only one entry per person. Only one winner per household. To be a valid winner, the entrant must not have won a prize from SWITCH within the last 28 days. Each winner will receive one double pass to 'The Guernsey Literary and Potato Peel Pie Society'. By entering, you agree to receive occasional emails from SWITCH in the future. If you decide to unsubscribe from these updates, any further entries will not be applicable. Only Australian residents are eligible to enter. 'The Guernsey Literary and Potato Peel Pie Society' is in cinemas from Thursday the 19th April 2018 through StudioCanal.